Recommendations from a professional photographer. 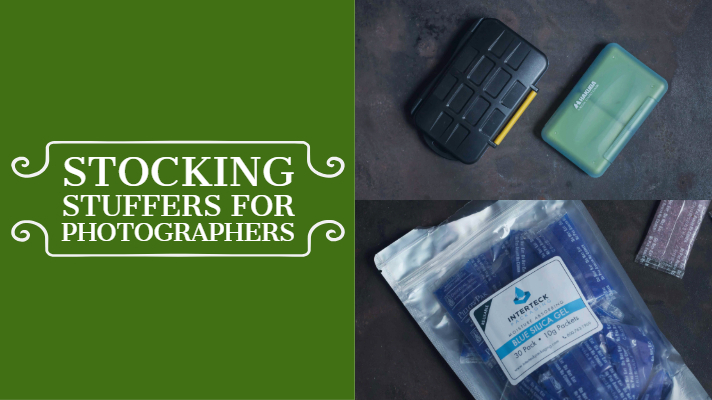 Perfect little gifts for someone who loves photography. Things they may not even know they want or need – until they find them in their stocking! POLARIZER – Most people think of a polarizer as a way to tone down the reflections off water, but it also stops reflections off leaves, so the true colors of the landscape come through. Using one can make a huge difference in the quality of the photos. It does double duty by both improving the color in the photos and adding a layer of protection for the lens. The polarizer must be the correct size for the lens. AN EXTRA BATTERY and AN EXTRA BATTERY CHARGER – It is always a good idea to travel with an extra battery and the battery charger, since you don’t want to run out of power in the middle of a shoot. You will need the correct battery for the camera, but this is the one that we use. UNIVERSAL POWER ADAPTER – This small, compact universal power adapter is perfect for traveling to a country where the electricity or plugs are different. It also includes a plug for charging a cell phone, so it’s a great gift for any traveler. EXTRA COMPACT FLASH CARDS – We use high quality cards with a fast speed, so we don’t miss a photo. There are cards that hold more photos, but we prefer to change cards rather than capturing an entire shoot on one card and risk losing the whole thing if there is a problem. The flashcard must be the correct one for the camera. RUGGED COMPACT FLASH CASE – Flashcards are valuable and need protection from water, salt and impacts. They become even more valuable when they are carrying all the irreplaceable photos from the shoot that have not been downloaded yet. So we protect the cards in a rugged carrying case that looks different from the one we use for blank cards to prevent a mix up. REUSABLE GEL PACKETS – We keep gel packets in the camera bag and the plastic watertight boxes where we store all the equipment- to reduce the humidity in the case and prevent mold. We love the reusable ones that turn color when they have stopped working and need to be dehydrated. LENS PEN – A lens pen is the perfect thing for cleaning sand and dust off the camera safely and has a tip for cleaning the LCD screen on the back of the camera. It’s that item that you didn’t know you needed until you have used it once, and then wonder why you didn’t get it earlier. The size and shape makes it easy to carry in your pack and have with you whenever you need it. DISPOSABLE LENS CLEANERS – These disposable wipes are so much better than using a cloth to clean an expensive lens. Keeping a cloth clean is difficult and impractical and it’s important not to use something that might have sand or mold spores on it. The individual wet and dry cleaners make lens cleaning easy when traveling or just out on a day shoot. A WHITE BALANCE CARD is helpful for correcting color, but it doesn’t help if it’s not handy. We have this credit card size, plastic one connected to the pack with a carabiner so it is always readily available. Just take a photo of the card when you start a shoot and color correction is instantly easier. A RAIN SLEEVE is a small, inexpensive item that is a real life saver if you just happen to need it. It weighs almost nothing and costs only a few dollars, so it’s great to through in the bottom of the pack as a cushion and have it if you need it.